Audry asked an excellent question in the comments of my last post about what my handspun yarn will grow up to be. It appears that I tend to spin like I knit: in fits and starts, with many, many works-in-progress, that take quite a while to come to fruition. I have been spinning since January 2012 and over the last 2.5 years I’ve completely finished spinning 17 full skeins of yarn (one skein = 2-6 oz, depending on project) and 14 little ‘test’ or sample skeins (10 from my spinner’s study and 4 from trying out new tools or experimenting). Some of my more recent finished skeins (since October 2013). And then, of course, I have 12 spinning WIPs (eek). One on each of my spindles, two that are resting off of my spindles, and the remaining are wheel projects in various stages of completion (why yes, I am out of bobbins, how did you guess?). The things I could accomplish with just a little more follow-through would be pretty amazing, amIright?! All of my handspun projects to date! Of my 17 full-size finished skeins, I have (at least partially) knit up 10 of them, have a hibernating WIP with the 11th, and gave 2 of them away as gifts. That leaves me with 4 unaccounted-for skeins. In the top left, we have the lovely skein of alpaca/silk I carded on a rented drum carder and finished spinning in April. It will most likely grow up to become a Morning Surf Scarf, when I get a chance to knit more regularly (read: post-wedding). Copyright Jackie Erickson-Schweitzer. Click for pattern page. The two skeins in the top right were from a spin-along last quarter. They are a generous 550 yards of 2-ply BFL wool destined to become a shawl. I’ve been eyeing up Joji’s The Way From Brighton, what do you think? Copyright Joji Locatelli. Click for pattern page. The skein on the bottom left is some more BFL, this time around 170 yards of DK-weight chain-plied yarn. I was thinking of some sort of hat, perhaps a Jango designed by Svetlana Volkova. I’d use it for the main color and then alternate some scraps for the contrast colors. Not sure yet, though. I like the neutral used in the pattern photo and I might want to pair my skein with a calmer color and knit a two-color shawl or cowl instead. Copyright tweedysheep. Click for pattern page. 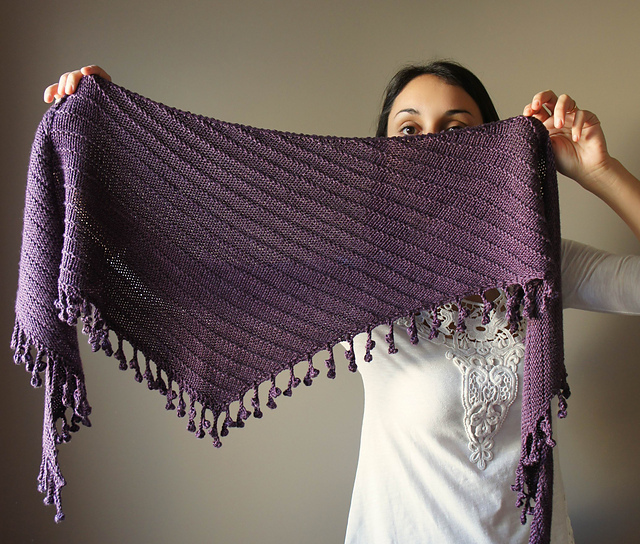 The final skein pictured is the last skein that I knit into a finished object way back in October 2013 (siiiiigh). 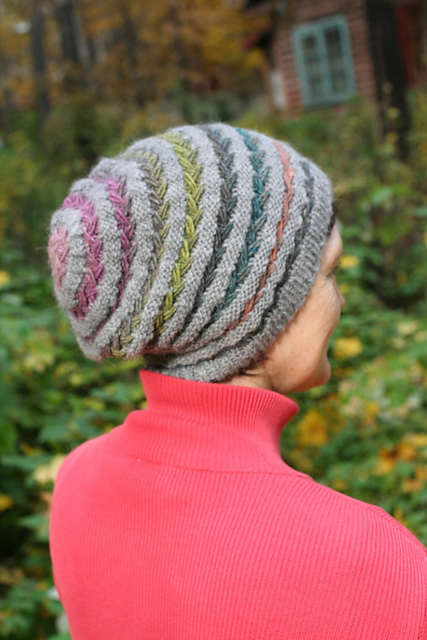 I knit that fluffy little 4-ply Merino skein into a pretty fabulous hat. What are your favorite handspun projects? I’d love to see what you’ve made with yours or what you’ve been dreaming of making. Share a link or leave a comment below! This entry was posted in designers, FY, handspun, hats, InspirationSaturday, scarves, shawls, spinning and tagged design, handspun, inspiration, knitting patterns by shoelaceswitcher. Bookmark the permalink. What a lovely post. I love how you are so well organized with your stash and your posts. And I have also decided that I need that hat in the final photo. I was going to comment on this post as soon as it was up. But then you linked to that lovely hat and I got distracted. I’ve got handspun sitting around too. I like seeing all these patterns that could look good with it. They are all patterns that I’ve not run across before. Thanks! Hearing that you have 12 spinning WIPs makes me feel much more relaxed 😛 I love your organic approach for knitting with your handspun! I have only knit one project with my handspun (and it was only for a border link here) so I definitely need to start more handspun projects!